Thanksgiving Traditions and Pumpkin Seeds! I’ve been thinking a lot about traditions recently. Highlights of childhood that still exist in yearly practice, and others that have faded into distant memory. 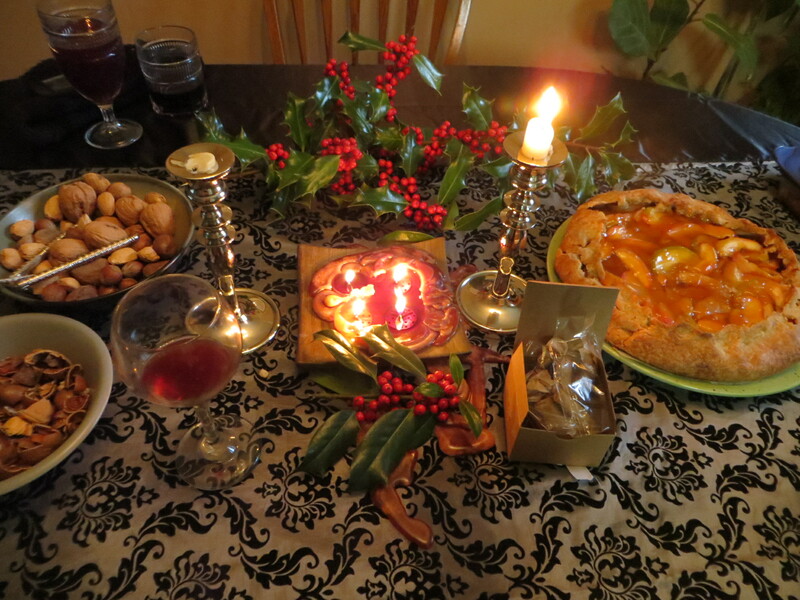 For me, the holidays seem to harness the most abundant traditions, particularly as a child. Gathering at church to sing carols on Christmas eve, then getting to open one present under the tree before bed; the large juicy orange we always found at the bottom of our stockings on Christmas morning; running around the neighborhood banging wooden spoons against pots and pans to ring in the new year with a loud ruckus; huge Easter egg hunts in frilly dresses with all of my siblings and friends. Our traditions were about celebration. Family time, connection, silliness. These days, in addition to the connection and silly time, the traditions that permeate my life tend to revolve around food. Food is a part of me. It’s how I express my love and creativity. How I lose and then rediscover myself. How I connect to the seasons. There’s the 3-day, completely from scratch, cherry pie for Katie’s birthday in July; the autumn trip to the pumpkin patch to pick out pumpkins, carve them, then roast the seeds (This is a newer one, but it counts. ); and the yearly Thanksgiving feast at the Boys Haus. This will be the 11th year our little chosen family has celebrated the holidays in this special home. The core group of us have all lived there or at least stayed for a length of time over the years. For me, it was for several months when I moved back from California in 2003, then again in 2007 when returning from travelling in Southeast Asia. These days Jasson and Titus are the main inhabitants of the Boys Haus, with Katie and I visiting most weekends. We all have our stories and our personal connection to this little yellow house, and our years of Thanksgivings are among my warmest and fondest memories. The love and intention everyone puts into the dishes they bring to share, the collaboration of all of the conscious kitchens in our friend circle. Our largest attendance was 30 people one year, tomorrow I’m expecting a more modest 15 or so. I will head north and join Katie in the kitchen tonight. I’ll prepare the turkey fixins, get the bird brining for at least 8-10 hours and get the kitchen ready for tomorrow’s full house. She’ll make pies and we’ll prep several of the dishes to make room for turkey to be in the oven all day tomorrow. We’ll laugh and make a schedule for kitchen use and will most likely open a bottle of wine and really dive in. With so much to be thankful for, I love spreading our celebration into 2 days! I hope that you will be sharing Thanksgiving with your most favorite people, nourishing yourselves with the best foods available and honoring all that there is in life to truly have gratitude for! As there will most certainly be pumpkin pie from scratch, here’s what I’ll be doing with those fresh seeds we dig out! Injoy! 1 Cut open the pumpkin by cutting a circle around the stem end with a sharp knife (knife blade angled in), and pulling off the top. Use a strong metal spoon to scrape the insides of the pumpkin and scoop out the seeds and strings. Place the mass of pumpkin seeds in a colander and run under water to rinse and separate the seeds from everything else. 2 Measure the pumpkin seeds in a cup measure. Place the seeds in a medium saucepan. Add 2 cups of water and 1 tablespoon of salt to the pan for every half cup of pumpkin seeds. Add more salt if you would like your seeds to be saltier. Bring the salted water and pumpkin seeds to a boil. Let simmer for 10 minutes. Remove from heat and drain. 3 Preheat the oven to 400°F. Coat the bottom of a roasting pan or thick baking sheet with olive oil, about a tablespoon. Spread the seeds out over the roasting pan in a single layer, and toss them a bit to coat them with the oil on the pan. Season with one of the spice blend variations. Bake on the top rack until the seeds begin to brown, 5-20 minutes, depending on the size of the seeds. Small pumpkin seeds may toast in around 5 minutes or so, large pumpkin seeds may take up to 20 minutes. Keep an eye on the pumpkin seeds so they don’t get over toasted. When lightly browned, remove the pan from the oven and let cool on a rack. Let the pumpkin seeds cool all the way down before eating. Either crack to remove the inner seed (a lot of work and in my opinion, unnecessary) or eat whole. **Also check out this recipe for cilantro and pumpkin seed pesto! This time of year can be a wonderfully festive time of connection and celebration. It is also full of opportunities to over-indulge and get off track with our wellness goals. 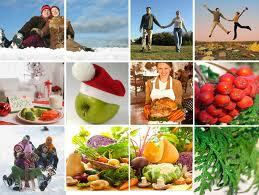 Below are 10 tips to survive holiday parties while keeping your health and vitality as a priority. Do not arrive to parties on an empty stomach. Eat a cup of vegetable soup or a small salad 30-60 minutes beforehand. Especially on big holidays, make sure to eat breakfast and a balanced snack with fiber and protein earlier in the day. Make sure you get a physical activity in. Workout before attending holiday parties, or rally everyone to go for a walk after a big meal. Stay well hydrated. Thirst signals can be mistaken for hunger signals. Make sure you’re drinking at least half your body weight in ounces daily. Also, drink alcohol lightly, and alternate alcoholic and sugary beverages with glasses of water at get-togethers. Bring a healthy dish to share- quinoa salad, smoked salmon, bean dip, fresh veggies, hummus and lean meats, shrimp cocktail. Mingle with guests away from the food table. Don’t make it easy to snack mindlessly. Use a small plate at the buffet and choose just a few of the dishes to try. Moderation is key. Do not dress for bloat. No baggy pants at holiday parties. Wear that slimming dress that hugs your figure or a nice suit that fits perfectly. Eat slowly. Take the time to sit and savor your food. Pace yourself and try to be the last person to finish each course. Take small bites and chew slowly and thoroughly. It takes about 20 minutes for you brain to get the message that your stomach is full. Ask the host of the party what you can do to help. Keeping yourself occupied and social will cut down on the time you are standing around munching. Plan your calendar to include holidays as higher calorie days. Eat lightly the rest of the week and avoid excess sugar and simple carbohydrates. In conclusion, enjoy the holidays! Take time to be present with those around you, focus on non-food related activities and relax! Your body will thank you! With ample cauliflower “rice” left over from this week’s grain-free fried rice, I decided to continue with my cruciferous kick and make a cauliflower pizza for supper. 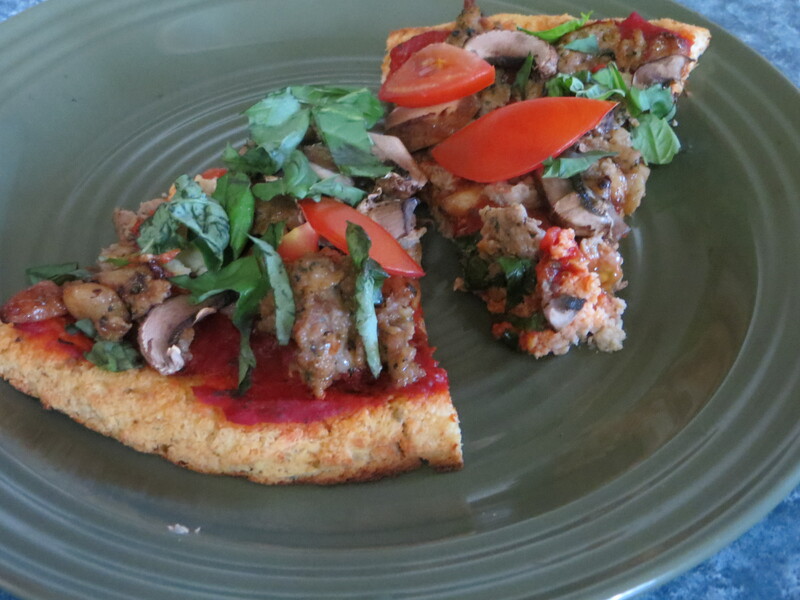 This is a delicious and nutritious gluten-free, low(er) carb alternative to traditional pizza crust. 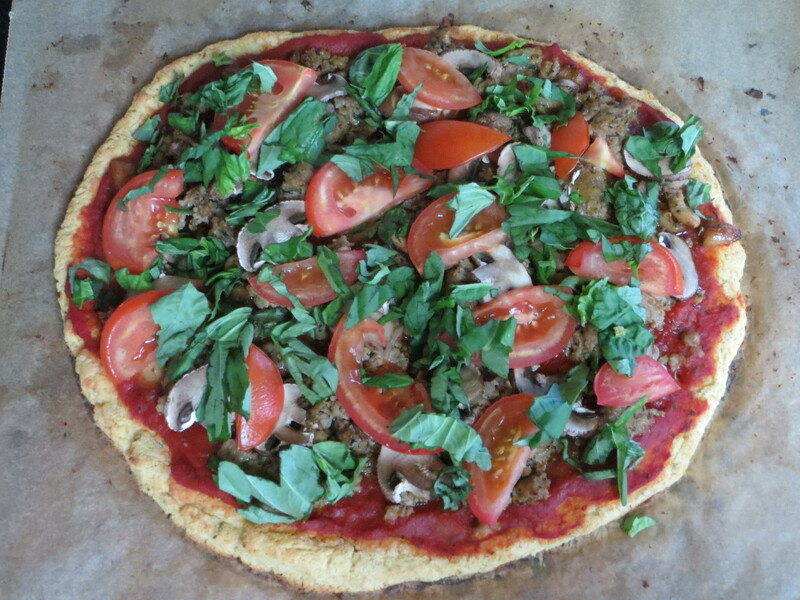 To balance the carbohydrates with protein and fats, I topped it with plenty of organic mild Italian sausage (which I cooked up before adding to the pie) as well as fresh pizza sauce, tomatoes, mushrooms, roasted garlic and added fresh basil after it came out of the oven. You could, of course, skip the meat to go for a vegetarian meal. Also, I have not tried alternatives to the cheese and egg in the crust to make it vegan, but you could try a flax egg and a soft vegan cheese if you like. I appreciate goat’s dairy because the proteins are smaller and closer to human milk, which makes it easier for us to digest. The crust does stay together well, but I do often use a fork when I load it up with delicious toppings. This recipe was modified from a post on Detoxinista.com. Injoy! 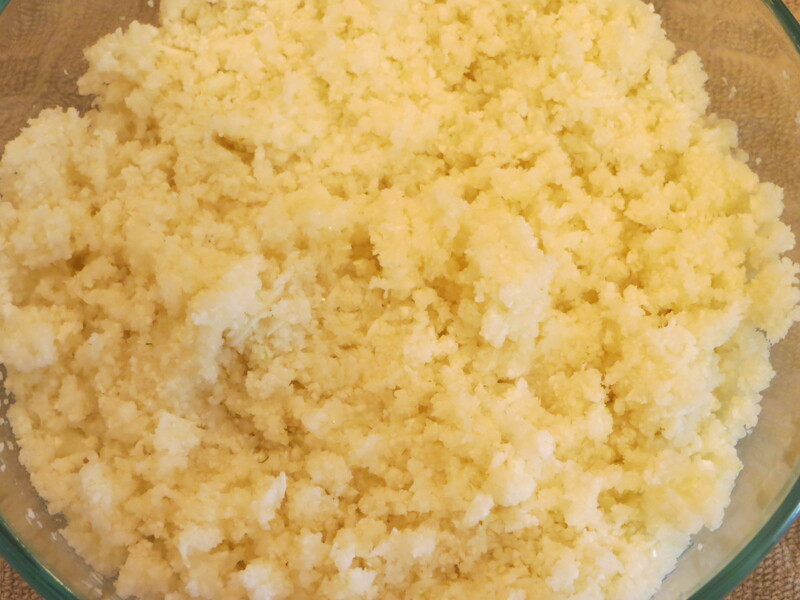 To make the cauliflower rice, pulse batches of raw cauliflower florets in a food processor until a rice-like texture is achieved. Once you’ve strained the rice and it’s cooled a bit, transfer it to a clean, thin dishtowel or a nut milk bag. Twist it up and SQUEEZE all the excess moisture out! A lot of extra liquid will be released, make sure to thoroughly squeeze. This will leave you with a nice and dry pizza crust. In a large bowl, mix up your strained rice, beaten egg, goat cheese, and spices. Don’t be afraid to use your hands! You want it very well mixed. It will be crumbly and unlike any pizza dough you’ve ever worked with, but don’t worry– it’ll hold together. 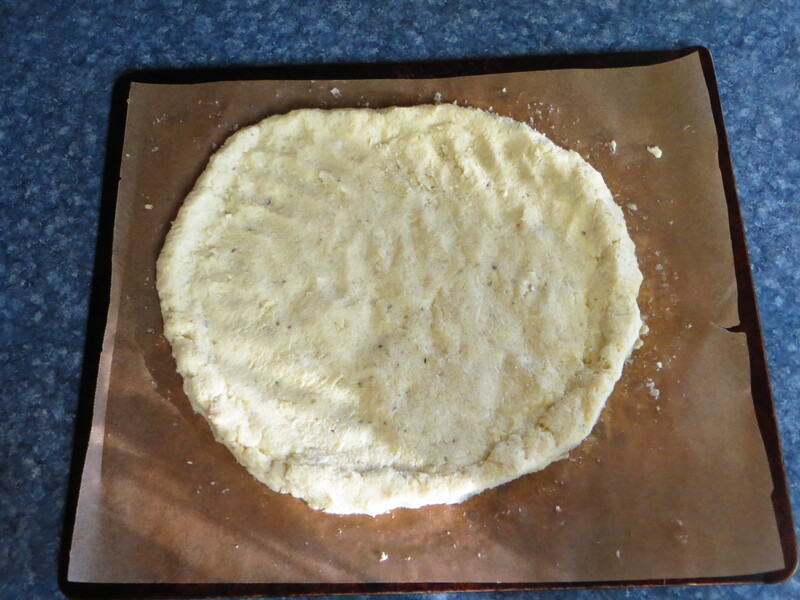 Press the dough out onto a baking sheet lined with parchment paper. (It’s important that it’s lined with parchment paper, or it will stick.) Keep the dough about ⅓” thick, and make the edges a little higher for a “crust” effect. Bake for 35-40 minutes at 400F. The crust should be firm, and golden brown when finished. 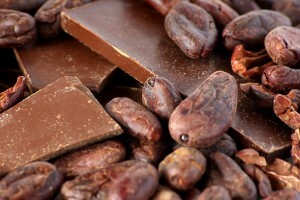 Raw cocoa is known to be one of the most nutritious super foods on the planet. It is the highest plant source of magnesium, iron, chromium and manganese. It is also extremely high in zinc, copper and phosphorous, minerals that are greatly depleted by stress. In addition, it is recognized to be the #1 antioxidant in the world. 15 times higher than blueberries, 20 times higher than green tea and 30 times higher than red wine. 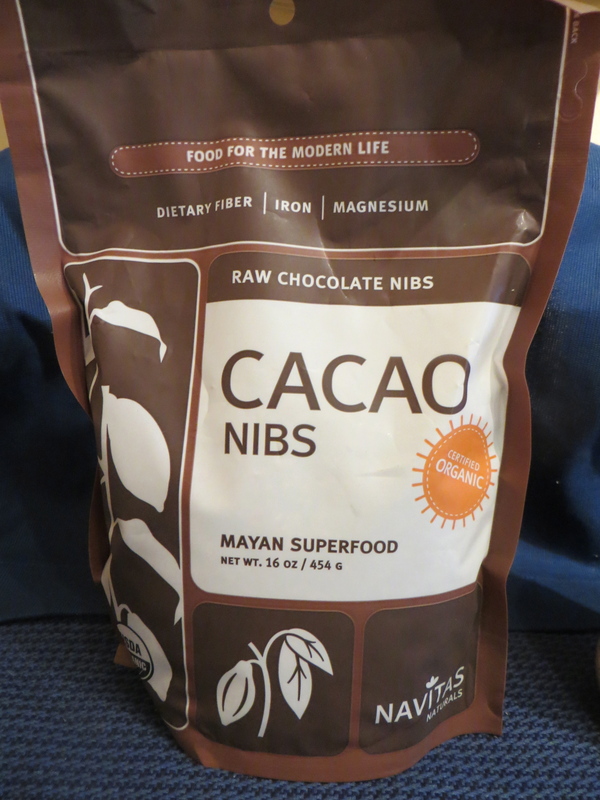 Also, if you’re looking to get more dietary fiber into your daily consumption, raw cacao provides a whopping 9 grams per 1 ounce serving. Now, lets be clear that the processed milk chocolate we find in the candy bar isle, while derived from the same plant, does not offer these same superfood benefits. A great way to include more raw cacao is to add it to a smoothie, or I sometimes sprinkle it onto a banana or spoonful of almond butter. Injoy! This recipe is so incredibly delicious, and got such rave reviews, I had to promise to incorporate it into my biweekly rotation of meals and lunches. I haven’t heard those resounding “yummmmms” about a new dish in quite awhile, so I am happy to oblige! Also, I haven’t had Chinese food in years, but the flavors and preparation of this dish brought me right back to traveling through SE Asia and watching movies with chicken fried rice in my early 20’s. One of my favorite things about food is the memories and nostalgia it can trigger. The tastes, smells and textures can deliver you right into another time and place. Also, avoiding grains and increasing a variety of vegetables for the last several weeks has inspired creativity in meal planning. This all-in-one supper provides a balanced nutritional profile and a tasty think-outside-the-box style of cooking. 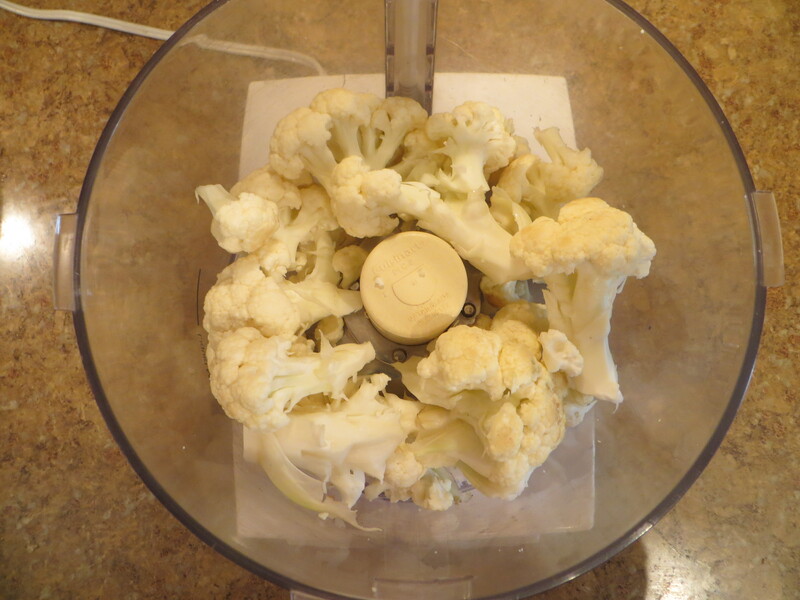 Cauliflower is a wonderful cruciferous vegetable to incorporate into your diet. It has lots of B vitamins, Vitamin C (though that does get depleted with cooking), fiber, potassium and protein. Injoy!! 1. Chop vegetables and whisk eggs. Grate the cauliflower on the larger side of a cheese grater, or pulse pieces in a food processor (recommended) until they are rice sized. 3. Heat your skillet or wok over medium-high heat. Add 2 Tbsp. coconut oil to the pan and allow it to melt. Add your onions and sauté until translucent. Then add garlic and carrots and cook for about 2-3 minutes. Add peas and cook 1 additional minute. Remove from pan and set aside in a large bowl. 4. Next add your whisked eggs to the pan and scramble them until they are lightly browned. Add a little sea salt and pepper, remove from pan and add them to the large bowl with the vegetables. 5. 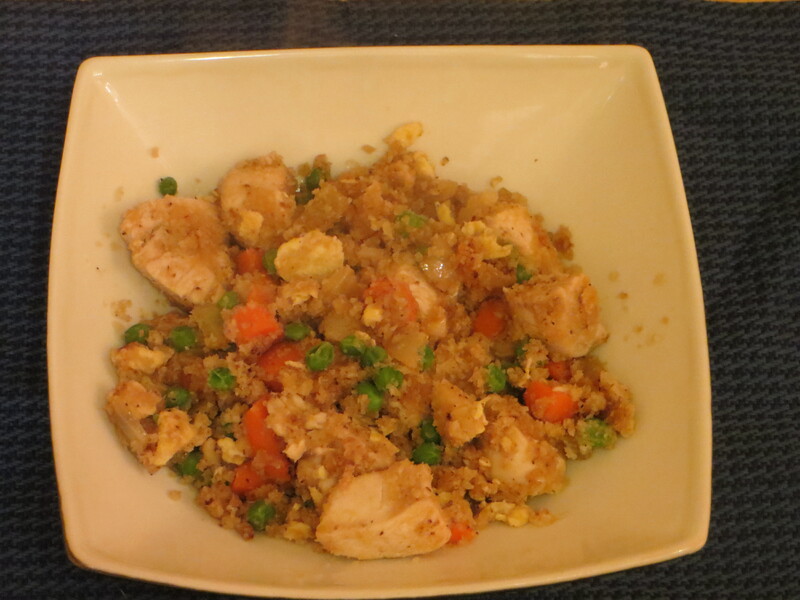 Chop chicken breasts into small chunks and saute them in the pan as well. Then add to the bowl with eggs and vegetables. 6. Next add the remaining 2 Tbsp. of coconut oil to the pan and allow it to get very hot. Add the riced cauliflower to the pan and toss it in the oil. Cook for about 5-7 minutes, only stirring every couple minutes so that it allows some pieces on the bottom to fry and get brown and crispy. 7. Add the vegetable and rice mixture back to the pan and stir to combine. Add the sesame oil, tamari, fish sauce and some additional sea salt and pepper to taste.